Egyptian armed forces this week demolished fences surrounding ancient Coptic monasteries, leaving them vulnerable to attacks by armed Arabs, robbers and escaped prisoners, who have seized the opportunity of the state of diminished protection by the authorities in Egypt to carry out assaults and thefts. "Three monasteries have been attacked by outlaws and have asked for protection from the armed forces, but were told to defend themselves." said activist Mark Ebeid. "When the terrified monks built fences to protect themselves, armed forces appeared only then with bulldozers to demolish the fences. It is worth noting that these monasteries are among the most ancient in Egypt, with valuable Coptic icons and manuscripts among others, which are of tremendous value to collectors." 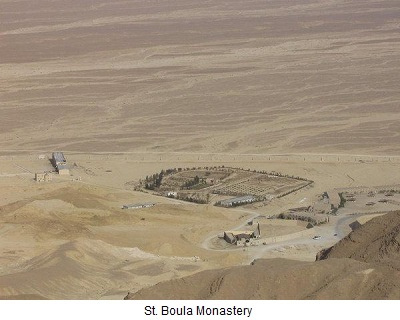 On Sunday February 20, armed forced stormed the 4th century old monastery of St. Boula in the Red Sea area, assaulted three monks and then demolished a small fence supporting a gate leading to the fenceless monastery. "The idea of the erection of the gate was prompted after being attacked at midnight on February 13 by five prisoners who broke out from their prisons," said Father Botros Anba Boula, "and were armed with a pistol and batons. The monks ran after them but they fled to the surrounding mountains except for one who stumbled and was apprehended and held by the monks until the police picked him up three days later." Father Botros said after this incident they thought the best solution to secure the monastery was to erect a gate with a small fence of 40 meters long at the entrance of a long wiry road leading to the monastery, which would be guarded day and night by the monks, and advised the army of their plan. According to Father Boulos, the army came with armored vehicles to demolish the gate, but it was agreed the monastery itself would undertake the demolition of the gate in stages as army protection is reinstated. "We told the Colonel it would look ugly to the outside world if Egyptian army is demolishing a gate erected for the protection of the unarmed monks under the present absence of security forces. We gave them full hospitality but we had a feeling that they wanted to demolish the gate in a 'devious' way." On Saturday morning, seeing that only three old monks were guarding the gate, the army returned. "When the army found that very few monks were present the soldiers, who were hiding in military vans, came out," said Father Botros, "bound the three monks, threw them to the ground and confiscated their mobile phones so as not to photograph the incident." The monks were set free after the gate and the 40 meter fence were demolished." Only four soldiers were left to guard the huge monastery. "The army was here not to protect the monastery as they claimed, but to carry out their agenda of demolishing the gate" said Father Botros to activist Ramy Kamel of 'Theban Legion' Coptic advocacy. "By removing the gate and the supporting small fence, the army is giving a message of encouragement to any thief or thug to break into the monastery." On February 21, armed forces demolished the fence surrounding the 5th century old Monastery of St. Bishoy in Wadi al-Natroun in the western desert. Father Bemwa Anba Bishoy said that after the January 25th Uprising, all the government security forces that were guarding the monastery fled and left the monastery unguarded. He said they were attacked by prisoners who were at large after escaping from prisons during that period. "We contacted state security and they said there was no police available for protection," Said Father Bemwa,"So we called the Egyptian TV dozens of times to appeal for help and then we were put in touch with the military personnel who told us to protect ourselves until they reach us." He added that the monks have built a low fence on the borders of one side of the monastery which is vulnerable to attacks, on land which belongs to the monastery, with the monks and monastery laborers keeping watch over it 24 hours a day. Although security officials welcomed this step., a fanatical Muslim officer at the district police headquarters named Abdo Ibrahim incited the Muslims in the neighborhood, but when the circumstances were explained to them and that the fence also secures the nearby mosque, they agreed. "Ibrahim then incited the army against us, so they came with heavy equipment and armored vehicles, insulted the monks, demolished the fence and left," said Father Bemwa. "Now the monks are left in the open, vulnerable to attacks from prisoners who are still at large or Muslim fanatics" (video demolished fence). In a related incident, Father Boulos, a monk at the Monastery of Abu Magar, also called St. Makarios of Alexandria in Wady el-Rayan, Fayoum, said that on February 21 armed forces stormed the monastery and wanted to demolish its fence and gate. He explained that after the security vacuum during the January uprising, the Monastery was attacked by thugs and Arabs armed with automatic weapons, leading to the injury of six monks, including one monk in critical condition who is still hospitalized. "The perpetrators took advantage of the fact that the monastery is a nature reserve and has no fence for protection. After the incident we have built a fence around the monastery to protect it, but the environmental agency rejected it and sent for the security forces and the army to remove the fence." He added that they were given 48 hours by the authorities to demolish the one-meter high fence, otherwise the army would be back to destroy it. "If no authority is in a position to protect us," said Father Boulos, "then let us do it ourselves, the way we see fit."